If you've tired of Rocky Horror and had enough of Hedwig, it's time to discover Forbidden Zone, a demented tribute to the hot jazz and dark glamour of a lost age, featuring new wave pop music and Cab Calloway-style insanity, filtered through the mind of a maniac. Released in 1982, the last gasp of the Midnite Movie craze, Forbidden Zone was largely forgotten but gained a loyal cult following on VHS and has since become a cult favourite. The film was born from a desire to capture on film the stage shows of The Mystic Knights of the Oingo Boingo, the touring troupe lead by Richard Elfman with musical direction from his brother, Danny Elfman. Elfman's score on Forbidden Zone would to lead to his first score for Tim Burton (with the film being a notable influence on Burton). With the stage shows of The Mystic Knights, the film would re-create music that could no longer be heard live: Cab Calloway, Duke Ellington, Django Reinhardt and Josephine Baker with off the wall compositions by Danny. A low budget production, Elfman did not hide the paper sets but rather incorporated and exploited them, a trick he learned from Jerome Savary, director of the French National Theatre and Elfman's mentor whilst in Paris. Elfman drew broadly on his inspirations for the visual style including nods to German Expressionism, the Three Stooges, Eraserhead, Alice in Wonderland, The Addams Family, the Marx Vrothers, Betty Boop, The Wizard of Oz, The Jazz Singer, Freaks, Bride of Frankenstein, Raging Bull and Ed Wood, as well as the animations of R. Crumb and Max Fleischer. 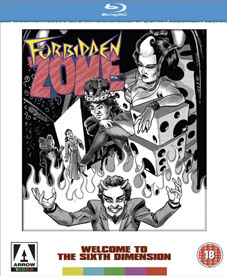 Forbidden Zone will be released as a Special Edition Blu-ray by Arrow Video on 7th May 2012 at the RRP of £24.99. Collector's booklet featuring writing on the film by director Richard Elfman and critic David Hayles illustrated with stills from the private collection of Richard and Danny Elfman.